Nova poi have a large flame size, average burn time, and are tip weighted. The burn time vs flame size is about half way between a Monkey Fist (long burn time) and a Cherry Bomb (big flame size). Nova's currently come in three sizes: 3” 4" and 5". 3" Heads are a good "average" size poi head, with a medium flame and a 4:30-5 minute burn time. * The unfueled weight is a light 4oz. We recommend them as a first fire poi set size, or for people preferring lighter heads. 4" Heads have large flames and around 5:30 minute burn times*. The unfueled weight is 6oz (a little above average). Better for more experienced spinners and not recommended for beginners. 5" Heads have huge flames and around 6:30 minute burn times. * The unfueled weight is 8oz. A good choice if you want very large flames and long burning wicks while feeling like you are in great control of the head. *Burn times are estimated based on recorded burns using pure "white gas" / Coleman's Liquid Camp Fuel. Actual burn times may vary based on individual spinning style, length of fuel soak, and other factors. There are two choices for leashes: Technora and twist link chain. Technora is our best feeling, preferred option. With great abrasion and temperature resistance properties (up to 932°F), Technora leashes allow fire poi to feel as comfortable and controlled as practice poi. 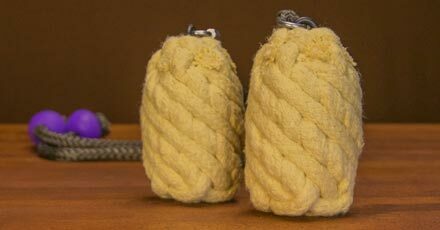 However, this rope is temperature resistant, not fire proof. If you allow the leashes to rest in flames for an extended period of time (for example: setting burning poi on the ground with the leashes on top of the heads, or a severe mid-burn tangle that takes more than a five to eight seconds to unknot), the leashes may take damage. Technora is recommended for intermediate and advanced poi spinners. Technora leashes will be +/- 1/4" of the overall length requested.